By any definition this is Mueller Weekend, right? We’re all sitting around waiting to find out what Special Counsel Robert Mueller has said in his report. The media and the public don’t know. The Democrats and Republicans don’t know. Donald Trump doesn’t know. Everyone is spending the weekend differently. Trump is spending it in a manner that’s strange even by his usually incomprehensible standards. It’s not just that Donald Trump has kept quiet during the thirty hours since Robert Mueller submitted his report. It’s that his only communication with the public came through – of all people – Kid Rock. Considering that Trump is in South Florida, and he nearly always golfs when he’s there, we’re not all that surprised that he was out on the golf course today. We’re not even surprised that he golfed with Kid Rock, considering the D-list celebrities he likes to periodically trot out. 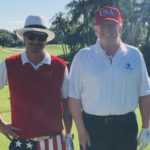 What we can’t figure is why Kid Rock tweeted the photo of the two of them on the golf course, and Trump didn’t. Think about it. If Donald Trump’s team put together this silly photo op because it wanted to give off the outward appearance that it’s (lazy) business as usual for Trump, why would they then rely on Kid Rock to be the one to announce it? Are they that tone-deaf about how ridiculous this looks? Even if this photo op was merely intended to boost the spirits of Trump’s base, without regard for how anyone else might interpret it, doesn’t this come off as weak even in the eyes of Trump’s base? On the other hand, if Team Trump decided that radio silence was the way to go this weekend, and it was important enough that they convinced Trump not to be seen or heard at all, then why did they allow Trump to pose for a photo with Kid Rock? Why did they not bother to tell Kid Rock to sit on the photo for a few days? None of this makes sense. Considering that so little about Trump makes sense in general, perhaps it’s fitting this his final hours before the release of the Mueller report are being spent in such bizarre fashion.